Martin Van Buren was appointed Secretary of State by President Andrew Jackson on March 6, 1829. Van Buren served in that capacity from March 28, 1829, to March 23, 1831. He was an astute career politician who approached foreign affairs with caution. Van Buren was born in Kinderhook, New York to parents of Dutch heritage. He attended village schools and became a law clerk at age fourteen, going on to study law and to join the bar in 1803. After moving to Hudson, New York, Van Buren served as the Surrogate of Columbia County from 1808 to 1813. He entered politics with election to the State Senate, where he served from 1813 to 1820. He then became the New York Attorney General from 1816 to 1819. Van Buren next won election to the United States Senate, serving from 1821 to 1828, and became Governor of New York in 1829. He resigned as Governor to join the Cabinet of President Andrew Jackson as Secretary of State. Following his three years as Secretary, Van Buren was elected Vice President under Jackson and served from 1833 to 1837. Van Buren won the presidential election of 1836, becoming the eighth President and serving until 1841. Jackson provided Van Buren an entrée to foreign affairs. Jackson selected Van Buren as Secretary of State as a reward for Van Buren’s efforts to deliver the New York vote to Jackson. As President, Jackson was hesitant to relinquish control over foreign policy decisions or political appointments. Over time, Van Buren’s ability to provide informed advice about domestic policies, including the Indian Removal Act of 1830, won him a place in Jackson’s circle of closest advisers. Van Buren’s tenure as Secretary of State included a number of successes. Working with Jackson, he reached a settlement with Great Britain to allow trade with the British West Indies. They also secured a settlement with France, gaining reparations for property seized during the Napoleonic Wars. In addition, they settled a commercial treaty with the Ottoman Empire that granted U.S. traders access to the Black Sea. However, Jackson and Van Buren encountered a number of difficult challenges. They were unable to settle the Maine-New Brunswick boundary dispute with Great Britain, or advance the U.S. claim to the Oregon territory. They failed to establish a commercial treaty with Russia and could not persuade Mexico to sell Texas. Van Buren resigned as Secretary of State due to a split within Jackson’s Cabinet in which Vice President John C. Calhoun led a dissenting group of Cabinet members. Jackson acquiesced and made a recess appointment to place Van Buren as U.S. Minister to Great Britain in 1831. While in Great Britain, Van Buren worked to expand the U.S. consular presence in British manufacturing centers. His progress was cut short when the Senate rejected his nomination in January of 1832. Van Buren returned to the United States and entered presidential politics, first as Jackson’s Vice President and then as President. 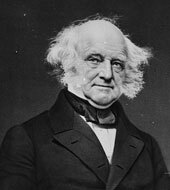 While serving as chief executive, Van Buren proceeded cautiously regarding two major foreign policy crises. He worked to diffuse a potential breach with Great Britain when Maine farmers attacked across the northern border and when Canadians burned the U.S. vessel Caroline in the Niagara River. Van Buren was also wary of worsening U.S. relations with Mexico. He declined to support the U.S. annexation of Texas, which would have added a slave state to the Union. Commissioned during a recess of the Senate. Commissioned to the court of the United Kingdom of Great Britain and Ireland. Nomination later rejected by the Senate.